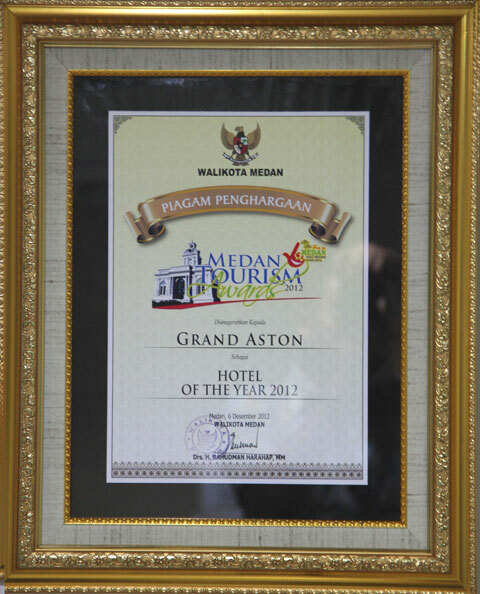 Medan, December 6th, 2012 - The year 2012 is indeed a great one for Grand Aston City Hall Medan. After receiving Best Hotel in terms of Safety and Security award by the Police Department of North Sumatera Regions in the beginning of this year, this five star hotel once again won an award from the government. 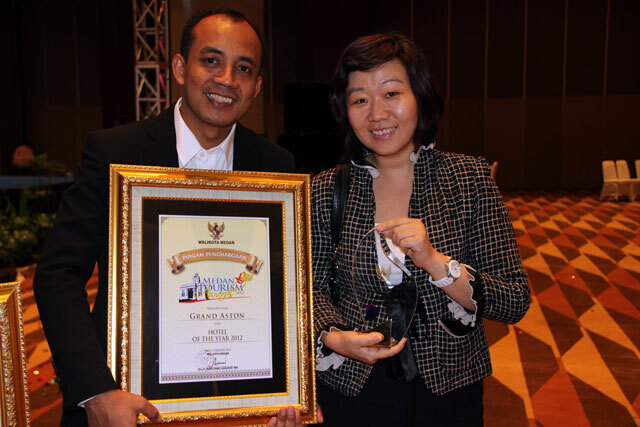 This time, Grand Aston City Hall Medan is awarded as the Hotel of The Year 2012 in five-star hotel category. 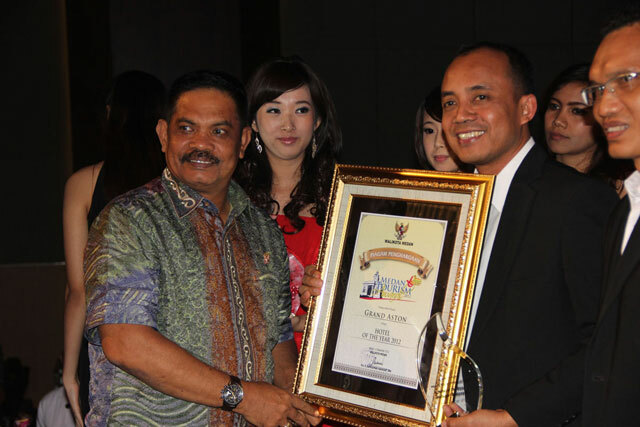 The award was handed by the Mayor of Medan City, Rahudman Harahap himself at Medan Tourism Award event on December 6, 2012. The assessment was made through some criterion, such as parking facility, lobby facility, food and beverage facility, hotel exterior and interior design, meeting facility, administration compliance, occupancy rate, income contribution, and heritage value. The panel of judges came from different backgrounds, such as the government agencies, parliament, university, and other tourism industry organizations. “This award is a form of appreciations from our guests and partners. We would like to give our appreciation to the government of Medan who inspires all the travel industries through this Medan Tourism Award event to keep contributing to the advancement of the tourism industry. We are proud to be the five-star hotel of the year and hence we take this award as a trigger to constantly maintain and upgrade our service quality” Wahyono, the General Manager of Grand Aston City Hall Medan expressing his gratitude on this achievement. Other hotels which are nominated as Hotel of The Year 2012 in five-star hotel category are Hotel Aryaduta Medan, Grand Swissbel-hotel Medan, and Grand Angkasa International Hotel. Apart from hotel, Medan Tourism Award 2012 also presented awards for other travel industry peers, such as travel agents, airlines, restaurants, media, cultural figure, and tour guides. This is the second time the Department of Culture and Tourism of Medan held Medan Tourism Award. Aston is Indonesia’s leading hotel operator with over fifty (50) hotels and around 12.000 rooms and villas throughout the Indonesian archipelago and a growing presence in Malaysia and the Philippines.